How far will Rose go to keep a promise? The recent Strigoi attack at St. Vladimir's Academy was the deadliest ever in the school's history, claiming the lives of many. Even worse, the Strigoi took some of their victims with them - including Dimitri. He'd rather die than be one of them, and now Rose must abandon her best friend, Lissa - the one she has sworn to protect no matter what - and keep the promise Dimitri begged her to make long ago. But with everything at stake, how can she possibly destroy the person she loves most? Blood Promise didn’t live up to Shadow Kiss. It was very different to be away from the academy whilst reading, but it was good. I... I’m really stuck for words on this; I don’t know what to say. I think there wasn’t too much effort in this book and was only written as a bridge between Shadow kiss, and Spirit Bound. Definitely the worst book in the series, so far. Positively I was happy when I thought Dimitri had died, but as we know – I was wrong. The Leech survived. 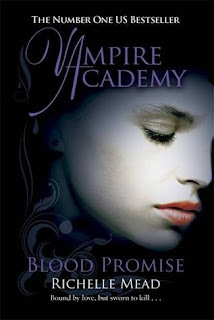 Lissa... wasn’t really involved in the story, neither was the academy hence the name Vampire Academy. Richelle tried writing from the perspective of both Lissa and Rose, and too be honest from the little of Lissa’s life I read about it was more interesting than Rose’s. Positively I liked the ending with the big fight and Lissa being compelled to commit suicide. I like the fact that it introduces lots of memories of Dimitri and Rose, but some of them were just page fillers. I mean yeah it was sort of good but to be honest the 5 stars I gave it on GD was only because I <3 the rest of the series. Like I said, not much to say about this and yeah, I was disappointed. this book kind of reminded me of New Moon. when edward leaved bella. very depressing. but in the end it will always be Rose-Dimitri and Bella-Edward right? I like the 3rd book better. but i do think that the 6th had it best on storyline and ending.